The outer ear is composed of the pinna, or ear lobe, and the external auditory canal. Both structures funnel sound waves towards the ear drum or tympanic membrane allowing it to vibrate. The pinna is also responsible for protecting the ear drum from damage. Modified sweat glands in the ear canal form ear wax. The middle ear is an air filled space located in the temporal bone of the skull. Air pressure is equalized in this space via the Eustachian tube which drains into the nasopharynx or the back of the throat and nose. There are three small bones, or ossicles, that are located adjacent to the tympanic membrane. 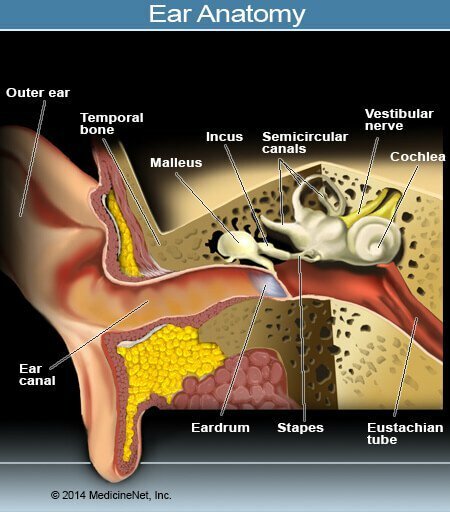 The malleus, incus, and stapes are attached like a chain to the tympanic membrane and convert sound waves that vibrate the membrane into mechanical vibrations of the three bones. The stapes fills the oval window which is the connection to the inner ear. The bony labyrinth itself has three sections. 1) The cochlea is responsible for hearing, 2) the semicircular canals have function associated with balance, and 3) the vestibule which connects the two and contains two more balance and equilibrium related structures, the saccule and utricle. The final structures of the inner ear are the round window and the eighth cranial nerve (cranial nerve VIII) which is composed of the vestibular nerve (balance) and the cochlear (hearing) nerve. Diagram of outer, middle, and inner ear. The outer ear is labeled in the figure and includes the ear canal. The middle ear includes the eardrum (tympanic membrane) and three tiny bones for hearing. The bones are called the hammer (malleus), anvil (incus), and stirrup (stapes) to reflect their shapes. The middle ear connects to the back of the throat by the Eustachian tube. The inner ear (labyrinth) contains the semicircular canals and vestibule for balance, and the cochlea for hearing. We hear by funneling sound from the environment into the outer ear and causing the tympanic membrane to vibrate. Those sound waves vibrations are transferred into mechanical vibrations of the ossicles. Those mechanical vibrations cause the oval window to move back and forth causing the perilymph of the inner ear to begin wave-like motions. The perilymph fluid motion is transferred to the endolymph and the wave motion is transformed into electrical impulses picked up by the hairy cells of Corti and sent to the brain via the cochlear nerve. The round window is responsible for absorbing the fluid wave vibrations and releasing any increased pressure in the inner ear caused by the wave motion. Balance is a choreographed arrangement that takes sensory information from a variety of organs and integrates it to tell the body where it is in related to gravity and the earth. Information from the vestibular system of the inner ear (semicircular canals, the saccule and the utricle) is sent to the brainstem, cerebellum, and spinal cord. Potential balance abnormalities do not require conscious input from the cerebrum of the brain. Abnormal vestibular signals cause the body to try to compensate by making adjustments in posture of the trunk and limbs as well as making changes in eye movement to adjust sight input into the brain. There are three semicircular canals in the inner ear positioned at right angles to each other like a gyroscope. They are able to sense changes in movement of the body. With such changes, endolymph waves within the canals cause hair cells located within their base to move. Position of the head is sensed by hair cells of the utricle and saccule which is stimulated when the head moves and the relationship to gravity changes. There is a small dense area of nerve fibers called the macule located in each of the saccule and utricle. The macule of the saccule is oriented vertically while the utricle macule is horizontal. Each macule consists of fine hair bundles which are covered by an otolithic membrane that is jelly-like and covered by a blanket of calcium crystals. The calcium crystals are the structures that ultimately stimulate the position hairs and provoke nerve impulses created by the position changes and transmit that information to the brain stem and cerebellum.